Irina Brook is celebrating her first Christmas season at the TNN, and she does it in style. In très British style, actually. If you’re used to the Anglosaxon way of ringing in the holidays, you could be forgiven if you get a little homesick at this time of the year. Great holiday traditions such as caroling or Continental style artisan Christmas markets, are slow to take roots here in the palmtree-studded South of France. Now, if you’re Irina Brook, the British-rooted director of the Théâtre National de Nice, you just take matters in your own hands and throw the doors of the theater wide open. The carol singers? They have been recruited from all around Nice… regular locals who simply enjoy singing and have been flocking to the TNN several Saturdays in a row to learn all the good old-fashioned songs of the festive season, under the animation and guidance of musicians Pascal Reva and Damien Petit, both members of the Peer Gynt cast, and Amy Blake (pictured below), an American soprano, to name but a few. “What an amazing initiative! It is such an uplifting and moving experience to participate in this carols event. We all love Irina Brook for her tireless efforts to include the Anglophone expat community in the artistic events in this city, and we’ll support her in that in any way we can,” commented Patricia Herdle-Bennett, an American resident of Villefranche who had heard about the carols jam by word of mouth, came along out of curiosity, and is now a fan. She in turn brought her French neighbor Céline who doesn’t even speak English or considers herself a good singer but joins in anyway because of the infectiously cheerful atmosphere. And now that international transplants and locals alike are all on the same page, or rather note sheet, the grand finale will take place on Saturday, 20th December. Irina Brook, her carolers, and Santa’s flying reindeer will stop over at Emmaüs in the afternoon. A traditional Christmas market, jampacked with homemade and artisanal products, and a host of activities ranging from cookie baking with chef patissier Serge Serain of Patisserie Cappa in Nice, to traditional dance, and the inauguration of Le Petit Théâtre, welcome visitors of all ages. In keeping with the (giving) spirit of the season, a raffle will be held and all proceeds will directly support Emmaüs’ charity. “I am so delighted at how warmly I have been welcomed in Nice that I really wish to give back by sharing some of the traditions dearest to me…. and if the TNN can help support an important charity like Emmaüs at the same time, all the better,” Irina tells us with that gentle, genuine smile that is her trademark. Later in the day, starting at 7pm, rendezvous with the TNN director and the carol singers at the Salon Royal of the fabled Negresco Hotel in Nice. All are welcome, be it to visit or join in. No reservations required. 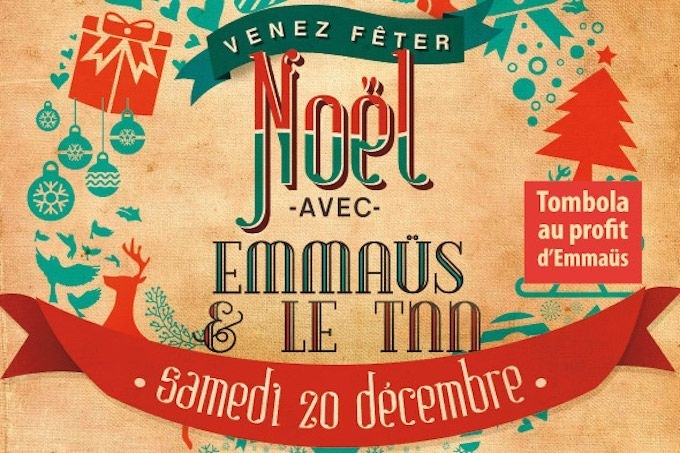 If you wish to display and sell your own artisanal/homemade products at the Emmaüs Christmas market, call Emmanuelle at the TNN at 04 93 13 90 90 to coordinate. From December 19 through January 4, the Ville de Nice will also do a daily 3D, Belle Époque-themed light show at 18h, 19h, and 20h, projected onto the façade of the TNN at the end of the Promenade de Paillon.